"Nancy Ann Batal, Westbrook College, Class of 1978"
Westbrook College student Nancy Ann Batal, Class of 1978, was a Fashion Merchandising major and lived in Goddard Hall. 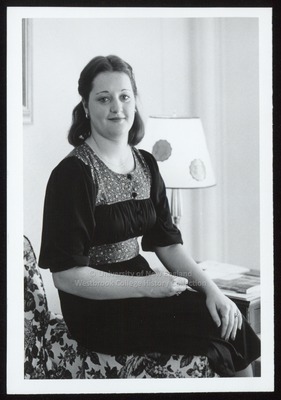 For her senior class candid photo, which appeared in the 1978 Tower Yearbook, she wore a dark dress with 3/4 length sleeves and a figured yoke and waist band. Her dark hair was parted in the middle, pulled back on the sides, and pinned at the back of her head. Nancy perches on the arm of a floral upholstered chair.